The Bank of Canada held the target for the overnight rate at ½% Wednesday. 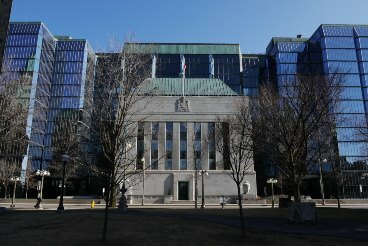 Canada’s economy shrank in Q2, according to the BoC; however it’s still predicting a bounce back by the end of the year. Financial vulnerabilities still exist, however, with household imbalances continuing to worry the Central Bank. The global economy, meanwhile, grew at a slower clip than the Bank had predicted in July. However, it is expected to show signs of strength in Q3 and beyond. Looking to the overall functioning of the economy it is a very prudent decision to help and sustain growth. Hoping for better times and keeping my fingers crossed for the end of the year to see economy going in to a higher growth trajectory. It is very encouraging to read that the BoC continues to hold a very firm grasp on our economic lives. It is staid, it is conservative and it works. Let the politicians pontificate however it is the BoC that is at the helm of this country.